This Sonoma County back yard was HOT!!! It literally cried out for a deck and patio cover. The western exposure meant that summer afternoon sun reflected off the wall of the house like a solar oven. The owner had to keep the shades drawn on the windows inside to keep the sun from overheating the house. 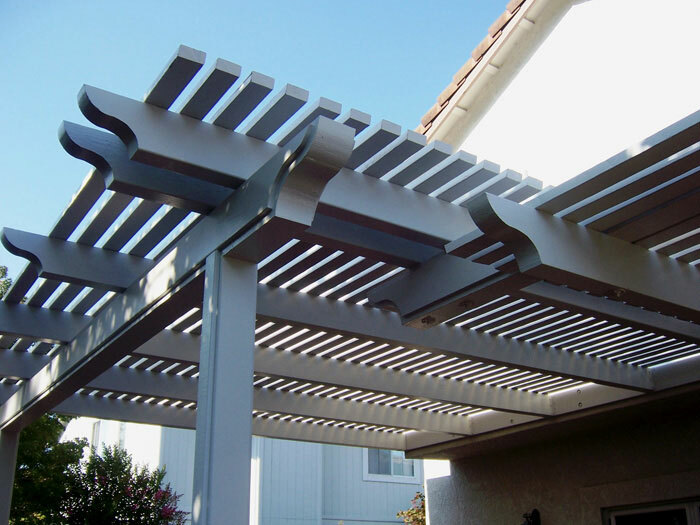 The solution was to build this elegant patio cover which is architecturally pleasing and transforms the back yard into a comfortable and inviting living area. One design challenge was that the house has a low eve in one area that we had to go under and a high attachment in another area. How were we to have two levels of roof with a graceful transition and a minimum of posts? We solved it by doubling the rafters and hanging a beam (using long bolts} and then hanging the rafters from the hanging beam. The whole patio cover only required three posts. Because of the high attachment we decided to use large timbers. The beams are 6×10 and the rafters are 4×8 with nice custom corbels on the ends. We spaced the 2×4 slats close together so they let in light but not the excessive heat from the sun. 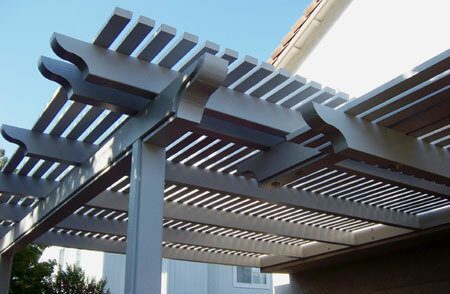 The white color matched the house trim and gives the structure a light and airy feeling. 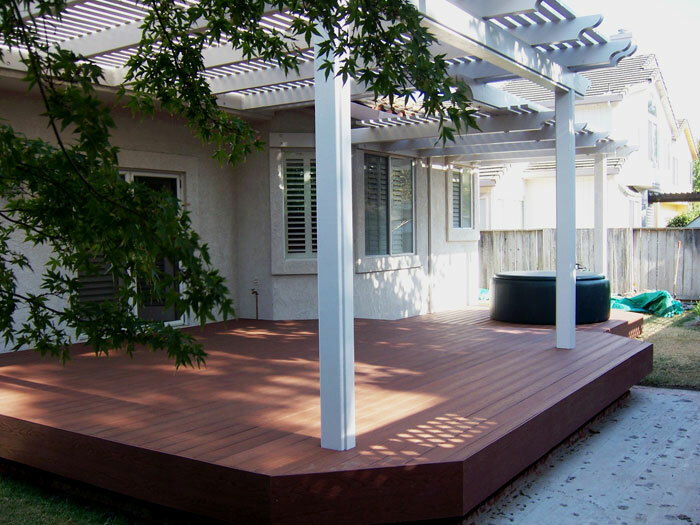 The deck below was built with Evergrain Cherrywood decking. This is a very rich looking composite that wears like iron. Of course we installed the decking with Deckmaster Hidden Brackets so there are no nails or screws to mar the deck surface. The owner can use her soft hot tub without worrying about stubbing her toes on protruding nail heads. 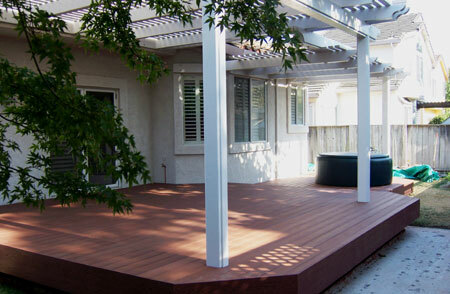 We added 12” fascia around the perimeter to hide the understructure and give the deck a finely finished appearance. 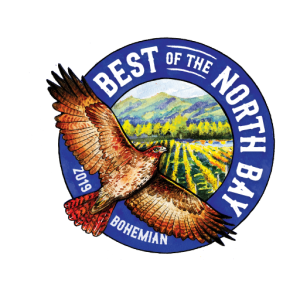 This was a very rewarding project because it completely transformed the backyard environment from being unusable on hot summer days to an inviting outdoor living area.